A product image along with its name is dull. It gives void feeling which would turn them to be the reason the users underestimate the product and even it’s quality. This is why you need to specify each and every feature of the product that you sell in your eCommerce store. And they are commonly addressed as product Add-ons. For a WooCommerce store, there are many plugins which let you create Add-ons for your products. And one among them is WooCommerce Product Add-ons. WooCommerce product Add-on plugin is simple and easy to use plugin including the installation of it. You can download the WooCommerce product add-on plugin from the WooCommerce store, and it costs $40. You can upload and activate the plugin-in your WooCommerce website on the plugin page. And if you have to build your WooCommerce app using Appmaker, then the plugin will be automatically integrated with your WooCommerce app too. Just as the installation and activation of the WooCommerce product add-on plugin, adding an Add-on to your WooCommerce store is also quick and straightforward. Once the installation and activation of the plugin are done, the add-ons can be added to all the products in your store, whether it be an existing one or a new product. For instance, let’s consider adding an add-on to an existing product at your store. 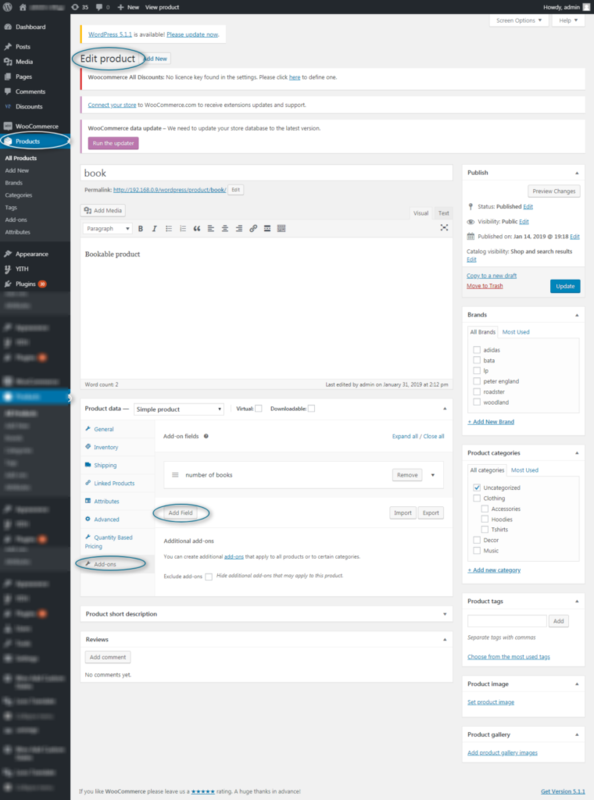 To add an Add-on, go to WordPress dashboard, then select the option ‘product’ and click on a product to which you want to include add-ons. There, inside the product data, you can see an ‘add-on’ option has appeared. This is where you can include ‘add-ons’ for the products. Product add-ons cannot be avoided unless you are selling a single product which no variation at all. Whereas if you have different products or even the same product with various features like color, size or material, Add-ons can are like letting the buyers personalize the products they buy. 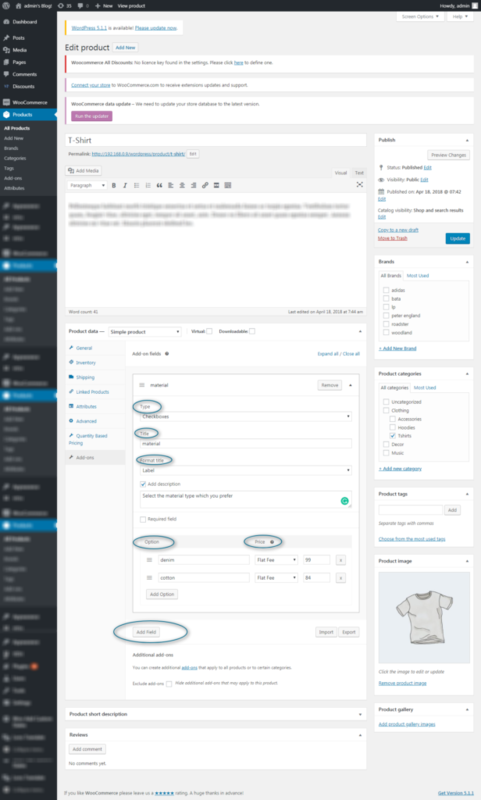 With each Add-ons mentioned above, you can edit the product page in your WooCommerce store. WooCommerce product add-on lets you customize each add-on’s they provide. By doing so, you can allow your users to personalize products before they checkout with the products. Choosing checkboxes as option. Here we included denim and cotton for the Tshirt along with price tag. As you can see, Here I have used checkboxes, and you can customize the Add-on. Here I have given options for the users to select between the material of the T-Shirt they prefer. Should I choose the WooCommerce Product Add-on? WooCommerce Product Add-on Plugin is a perfect Plugin that you can add for your WooCommerce Store. It simplifies your effort and lets you customize the Add-on for each product in your store. The main advantage of WooCommerce product add-on plugin is, it is compatible with most of the plugins and works finely in WooCommerce app. And we rate it 4.7/5. Integrating WooCommerce product Add-on to your WooCommerce app can is as simple as integrating this plugin with WordPress website. Especially if you have your WooCommerce app build using appmaker, the plugins get automatically integrated with the app when it is added to the site. This is because the WooCommerce app build using appmaker is connected with your WooCommerce site. Want to build an eCommerce app with complete WooCommerce plugin integration?